Sleeping Tree Camp is a small giant camp southwest of Whiterun, and where the Sleeping Tree is located. It is situated almost due west of Western Watchtower. Giants and their herd mammoths inhabit the camp, and will attack those who ignore their warnings to leave. 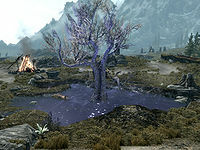 The Sleeping Tree grows from a pool in the center of the camp, along with two nirnroot plants. The tree emits a purplish glow, and its sap increases health for a limited time, but with the side effects of slowed movement and blurred vision. Sleeping Tree Cave is located inside the camp, northwest of the tree. The cave is occupied by a single giant that seems to have killed an Orc named Ulag. You can find a dose of Sleeping Tree sap and Ysolda's message on his body. Next to Ulag's body is an unlocked chest containing random, leveled loot. Three leather strips can be found atop a ledge to the right of the chest, and an orichalcum ore vein is located along the south wall next to a mammoth cheese bowl. Reading Ysolda's message activates a miscellaneous quest, in which Ysolda will offer money for Sleeping Tree sap. When doing the corresponding quest, Ysolda will tell you two different origin stories of the tree, if asked: that the tree is a piece of the Red Mountain which broke off when the mountain exploded, or that it was a spore that fell off a flying island. The latter story is likely a reference to the book The Infernal City. Sleeping Tree Cave: Question Ysolda about an interesting note you found on a dead Orc. Just to the southeast is an unmarked circle of stones containing a puzzle and treasure. The puzzle is a standard stone-matching puzzle, with a handle in the middle of the circle next to a stone archway. The stone to the east should be turned to show a snake towards the handle, the stone to the west should show a whale, and the stone to the north should show an eagle. Pull the handle to open a pit in the ground and get your treasure, which includes a copy of the Destruction skill book A Hypothetical Treachery in a chest. Opposite to that circle of stones, on a small hill east of Sleeping Tree Camp, are some ancient Nordic ruins with an altar in the center. Lying on this altar is a deceased conjurer, some alchemy ingredients, and a copy of the Conjuration skill book Liminal Bridges. Two hostile skeletons inhabit these ruins. Next to it a unique third skeleton wearing a Black Mage Hood stands by three mysterious graves. Close to the camp on the north is a mammoth skeleton with a human skeleton inside. The Sleeping Tree sap spigot can become unstuck from the tree and fall off. This needn't be a problem, as it still gives you the sap even when it's no longer attached to the tree. More problematically, the spigot can float off and become hard to locate. Area-effect spells such as Fireball will throw the spigot, so if it comes off the tree, refrain from using anything that goes 'boom' near the pond. You can drag the spigot like any other world item, so if you prefer to keep it safe and don't mind walking a ways, you can take the spigot to a safe place near a fast-travel point. A good safe zone is just outside the Whiterun city gates. You can use the console command prid 000AED8B followed by moveto player to teleport the spigot to you if it gets lost. For best result, stand on plain ground. The spigot might otherwise appear inside the terrain where you cannot access it. This page was last modified on 7 January 2019, at 04:43.